I must point out that this is my third "Big Finish" post in a row, which shows you how many deadlines I've had this spring. 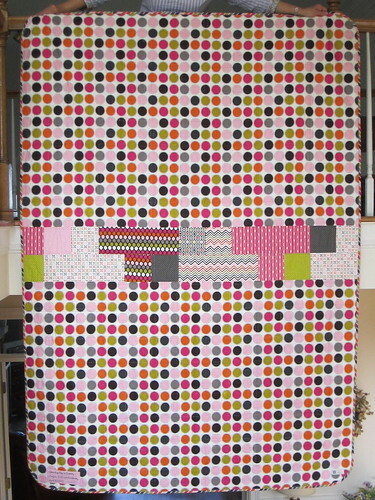 I'm looking forward to more fun, in-progress style posts to come, but for now, here's the lowdown on this group quilt project. 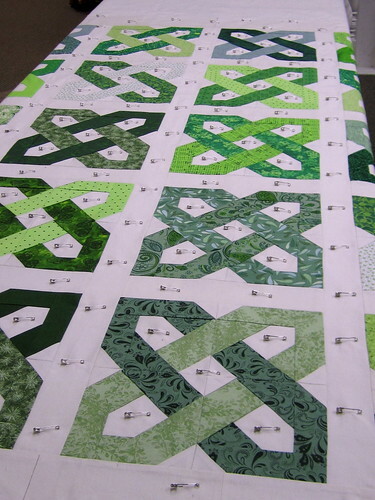 The blocks that make up this quilt were constructed by 16 people with varying levels of sewing experience and skill. In my other life, I'm part of an adult Irish dance group called Celtic Motion. 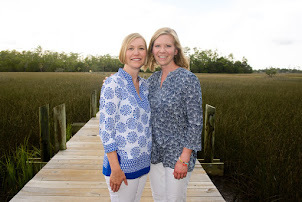 One of our longtime members is getting married this summer, and another member suggested that we all work together to create a quilt as gift from the group. 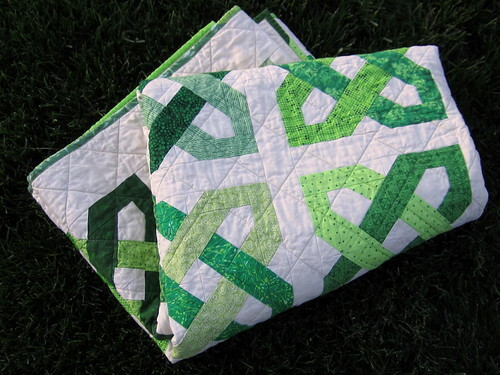 After ruling about a bunch of designs that would be too complicated, we settled on the Four Ways Knot pattern, which is a foundation paper piecing pattern available for download on Craftsy. I selected a foundation paper piecing pattern because I knew it would produce the most consistent blocks, which would make putting them all together into a quilt top more manageable. I created the two blocks above to test the pattern and show the group what they'd be making. Each contributor received a kit containing all the neutral fabric pieces they'd need, paper foundations for the 4 quadrants that make up the block, and a neutral square for their signature block. 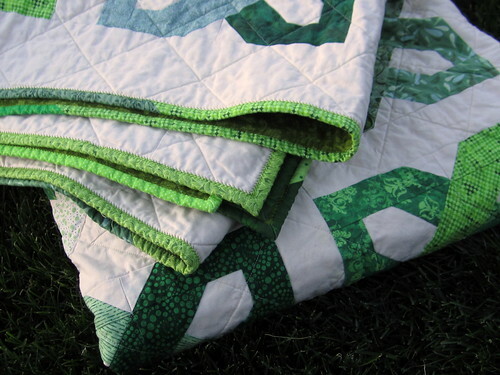 Each contributor was responsible for providing his/her own green fabrics, with the only requirement that the greens contrast each other for the best visual impact. I also created detailed instructions with photos showing what the quadrant should look like at every step. Some folks made 1 block, some 2, and some more. I lost track of how many I made in the end -- 6, I think. 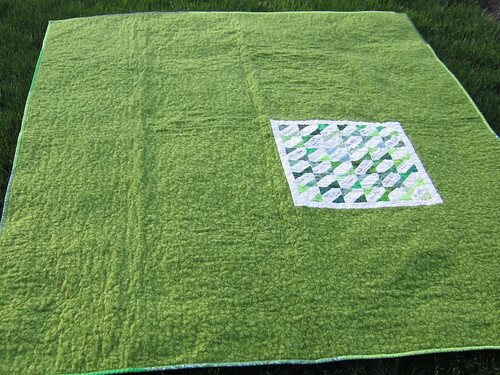 Another contributor and I trimmed and sewed all the 4 quadrants into blocks, again to ensure some uniformity. After all 30 blocks were made, my partner in this project assembled the top with sashing and borders. 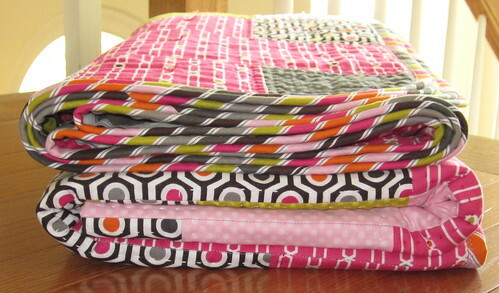 We shopped for backing, and then I spent 2 hours using every last pin I own basting the quilt. I took advantage of the empty classroom space at my local quilt shop to spread it out on their tables and make the pinning process much easier. The 10-inch blocks made it necessary to quilt over them instead of around them, so I used a simple crosshatch pattern and marked every line first to keep them all straight and evenly spaced. 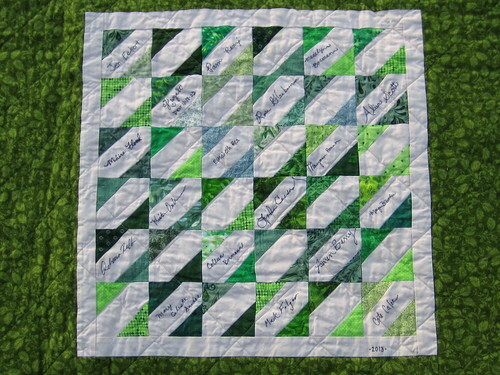 For the back, we chose a green quilter's flannel with a leaf print, and I inserted the panel of signature blocks that everyone made and signed. We used this tutorial for the blocks. Finally, leftover bits of fabric made a scrappy binding, ﻿and I used my favorite decorative stitch to secure the binding by machine. 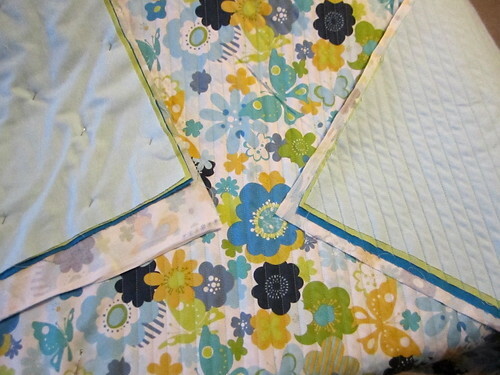 This quilt was a lot of work -- from planning to creating instructions to coordinating to finishing. I was lucky to have some enthusiastic contributors who were so thrilled to see their work come together into the finished quilt. 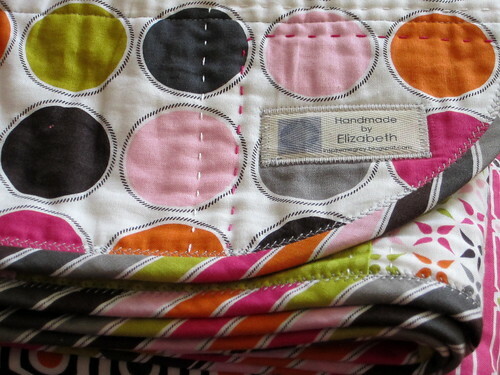 For some, it was the first thing they'd ever sewn on a sewing machine! Everyone did a great job, and I hope this quilt is appreciated and used for many years. 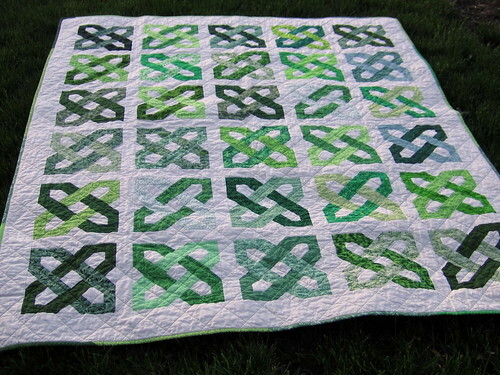 My recent finish was this Plus Quilt, commissioned for friend Lily's 1st birthday. You can see my first post about this project here. It's a twin size (approx. 65 x 90 in) and possibly the largest quilt I've made to date. 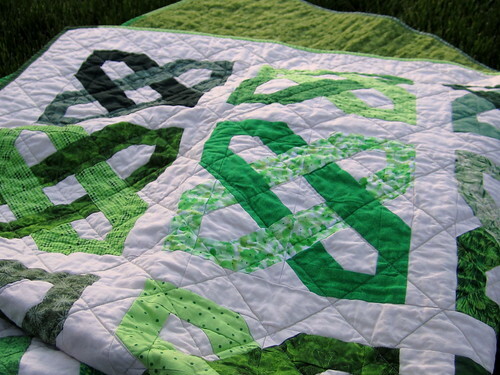 I've entered this quilt in the Blogger's Quilt Festival, in the Bed Quilt category. 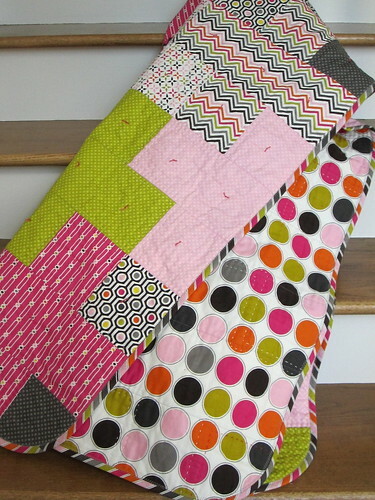 Click here to vote for my quilt! 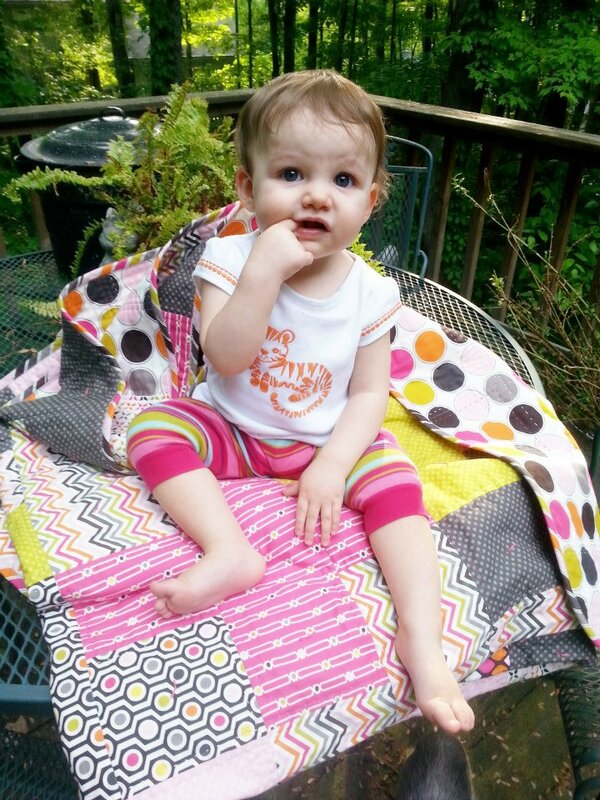 The fabric is Hot Chocolate by Jacqueline Savage Mcfee, purchased from Hawthorne Threads. For the back, I used a large dot print, with a pieced insert to get the desired length. Despite some trouble with my basting process, the dots on the back are surprisingly straight. Lily's grandmother requested the label below. I made a similar label for Lily's Raw Edge Circle Quilt and still had the font saved on my computer, so that's a nice link between the two quilts from Lily's grandparents. 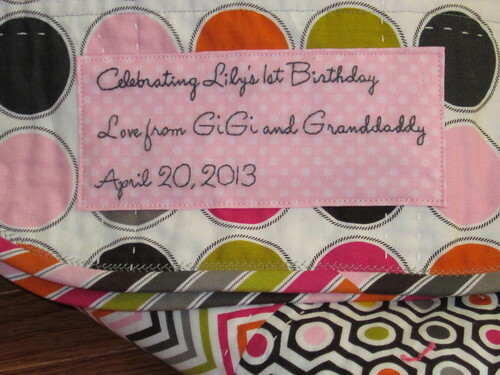 The timing worked out perfectly and I was able to deliver this quilt in person to Lily, her mom, and her Gigi. I hope it will be well-loved and used for many years to come. 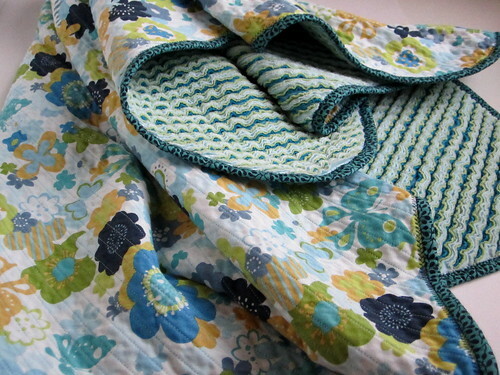 I recently finished two more chenille blankets for baby gifts. The first one I made late last year was paisley with orange, red, and yellow chenille -- check it out here. 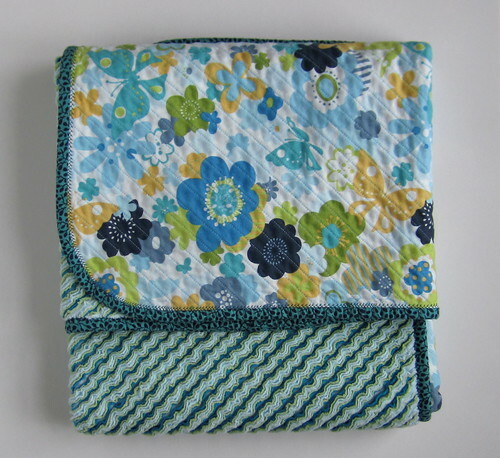 For blanket #2, I used a blue floral print (Momo for Moda) with blue, green, and turquoise flannel for the chenille. Blanket basted and sewing lines (1/2 inch apart) in progress. Tension reliever -- slicing through the flannel layers. 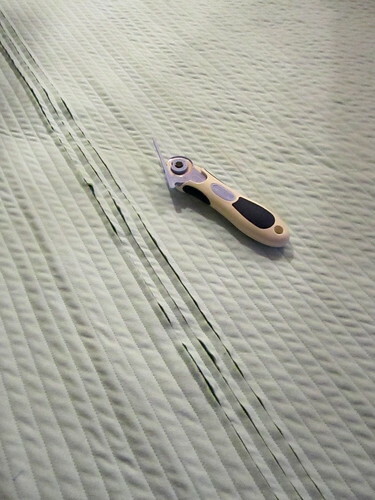 The slash cutter is essential for this blanket. After being washed and dried, the flannel edges curl up into chenille. I was happy with this result and the pop of turquoise. These blankets are a bit of a risk -- it's really hard to envision the finished chenille, so it's always a surprise to see what comes out of the dryer. 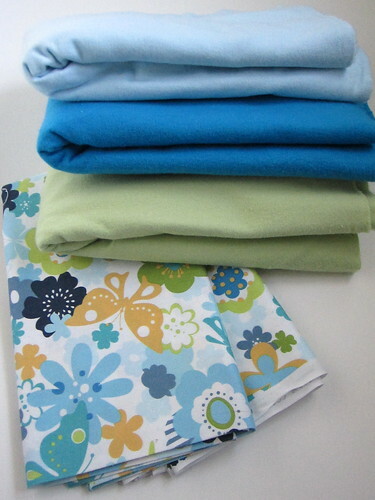 This blanket went to my friend who is expecting a little girl. 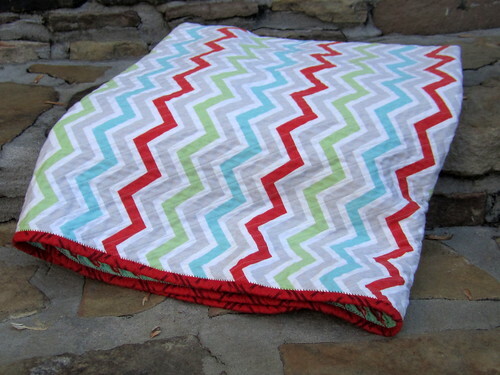 Blanket #3 is a chevron print and chenille that reminds me of ribbon candy. 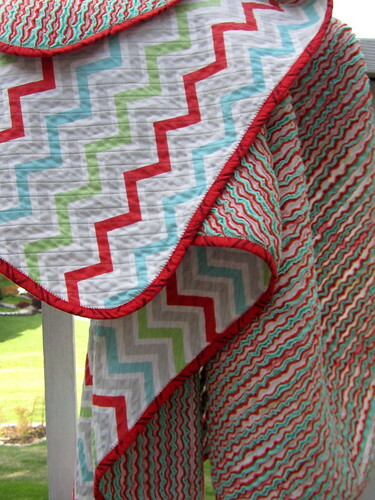 I ordered the chevron from Fabric.com and selected red, aqua, and white flannel for the chenille. This blanket now belongs to my cousin, who's also expecting a girl soon. 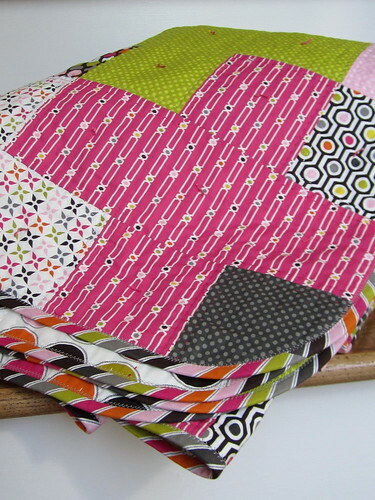 This binding is also a DS Quilts print. It's the perfect tomato red, and I like that the little slashes mimic the sharpness of the chevron.